Dr. Wolfman is an Assistant Professor at Uniformed Services University of the Health Sciences, Walter Reed National Military Medical Center, Bethesda, MD; Dr. Allison is an Associated Professor and Director of Ultrasound, and Dr. Ascher is a Professor and Co-Director of Abdominal Imaging, in the Department of Radiology, Georgetown University Hospital, Washington, D.C.
For patients with gynecologic disease, including women with abnormal uterine bleeding, imaging is an essential tool in every stage of management. 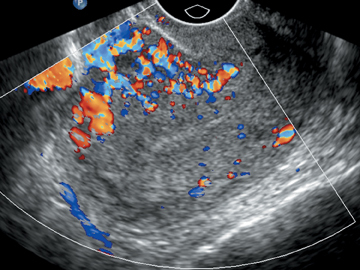 Ultrasound (US) is the accepted primary modality for the evaluation of abnormal uterine bleeding. Sonohysterogram (SonoHSG) and magnetic resonance imaging (MRI) are useful for problem solving and when US is indeterminate. The most common benign etiologies for abnormal uterine bleeding diagnosed on imaging include leiomyomas, adenomyosis, endometrial hyperplasia, and endometrial polyps. This article will review the imaging findings on US, sonoHSG, and MRI of the most common benign etiologies of abnormal uterine bleeding. 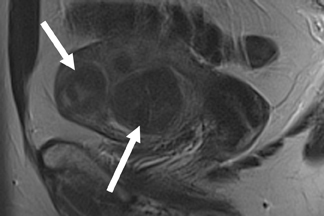 Leiomyomas, also referred to as fibroids, are the most common pelvic tumors, occurring in up to 25% of women over the age of 35.Leiomyomas are composed of smooth muscle cells arranged in a whorl-like pattern with variable amounts of intervening collagen, extracellular matrix, and fibrous tissue. Leiomyomas are classified according to their location: Intramural, submucosal, subserosal, and pedunculated (Figure 1). Leiomyomas can also occur, although less commonly, in the cervix, broad ligament, or completely unrelated to the female genital tract. As fibroids grow, they can outgrow their blood supply and degenerate. Five types of degeneration have been described: hemorrhagic or carneous, hyaline, fatty, cystic, and sarcomatous. Sarcomatous degeneration is much less likely, occurring in < 2% of cases. Transvaginal ultrasound (TVS) is the initial imaging study of choice. 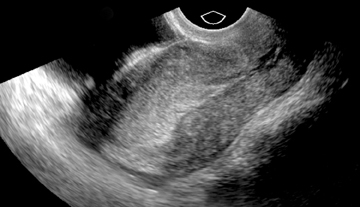 However, TVS can be limited by its restrictive field of view, the patient’s body habitus, and/or distorted anatomy secondary to large and/or multiple fibroids.1-4 Although the ability to detect small leiomyomasis increased with TVS, their precise location in relation to the uterine cavity is uncertain at times.5 Performing a transabdominal US, in addition to TVS, is helpful in evaluating for leiomyomas that extend beyond the field of view on TVS (Figure 2). MR is useful in cases whereTVS is equivocal or nondiagnostic for the above reasons. SonoHSG can be useful to distinguish submucosal leiomyoma from endometrialpolyps. On MRI, leiomyomas are well-circumscribed masses that have low T2 signals relative to the myometrium, with lesions as small as 0.5cm routinely imaged.12 A high-signal intensity, T2 rim is often present and represents dilated lymphatics and/or veins and/or edema.13 Leiomyomas have an extremely variable appearance after gadolinium contrast administration; they may appear as hypo-, iso- or hyperenhancing compared to the adjacent myometrium (Figure 6).14 On T1-weighted images, nonhemorrhagic leiomyomas are not visible except for the distortion of the uterine contour that may occur. Leiomyomas over 3 to 5 cm often have a heterogeneous T2 signal secondary to degeneration.15 Hemorrhagic degeneration appears as high-T1 signal without gadolinium contrast enhancement (Figure 7). Advanced hyaline degeneration can sometimes include fatty degeneration. However, if macroscopic fat is detected in a uterine mass, a benign mixed Müllerian tumor or lipoadenofibroma should be considered.12,16 The MR imaging appearance of leiomyosarcomas is limited. In one study of 12 cases, masses with 50% high T2-weighted signal,tiny high T1-weighted signal foci, and well-demarcated nonenhancing regions raise the suspicion of sarcoma.17 Other characteristics that suggest possible sarcomatous degeneration include a suddenly enlarging leiomyoma, especially after menopause, and/or indistinct borders and/or invasion into adjacent structures. Adenomyosis is a condition in which ectopic endometrial glands and stroma are embedded in the myometrium. 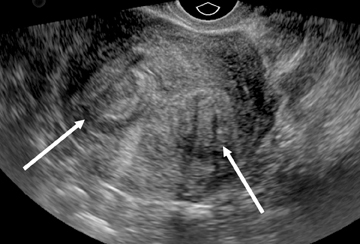 Sonographic features of adenomyosis are best appreciated using higher-frequency transvaginal transducers and during real-time scanning as opposed to static images. 22 In most patients,adenomyosis appears as myometrial heterogeneity that may be focal or diffuse (Figure 8).21,24 Myometrial heterogeneity results from a combination of echogenic foci, representing heterotopic endometrial tissue, and hypoechoic foci representing smooth muscle hyperplasia.25,26 Diffuse adenomyosis often results in asymmetric myometrial thickness and/or globular enlargement of the uterus. Other findings in adenomyosis include small myometrial cysts representing dilated cystic glands and echogenic nodules and/or linear striations extending from the endometrium into the myometrium representing ectopic endometrial tissue. Junctional zone width on MR is an important criterion used to diagnose adenomyosis. If the junctional-zone width is ≤8 mm, then adenomyosis is excluded. If the junctional-zone width is ≥12 mm, then the diagnosis of adenomyosis can be made with confidence. 33 However, if the junctional-zone width is between 9 to 11 mm, then the presence of ancillary findings may help to establish the diagnosis of adenomyosis (Figure 10). Ancillary findings in adenomyosis include: poorly defined margins, high-signal foci on T1- or T2-weighted sequences and linear striations of high T2-signal radiating from the endometrial zona basale into the myometrium. The high T1- or T2-weighted signal-intensity foci may represent ectopic endometrium, cystically dilated endometrial glands, and/or hemorrhage.18-19, 30-31 High signal-intensity striations may cause pseudo widening of the endometrium. Adenomyosis is usually occult on T1-weighted sequences with the exception of occasional high-signal foci that represent hemorrhage.18,31 Gadolinium contrast enhancement does not aid in the diagnosis of adenomyosis.14,19 Early phase images may show perfusion abnormalities and a “swiss cheese” appearance. This “swiss cheese” appearance is secondary to cross-sectional imaging of dilated endometrial glands within the myometrium. TVS and sonoHSG are the studies of choice for the characterization of endometrial hyperplasia. MR is useful when these modalities are nondiagnostic or when sampling of the endometrium would be difficult. 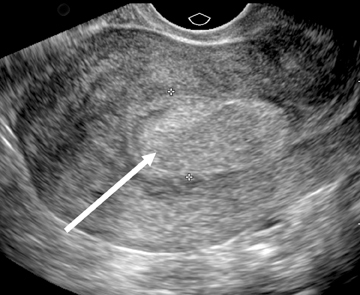 On US and sonoHSG, endometrial hyperplasia usually appears as a diffusely thickened, echogenic endometrium (Figure 11). However, focal, asymmetric thickening may also be seen. Small cysts may be seen in endometrial hyperplasia representing dilated cystic glands at histology.35 The US and sonoHSG appearance of endometrial hyperplasia is nonspecific and endometrial hyperplasia cannot be differentiated from endometrial carcinoma based on imaging alone. gadolinium contrast, hyperplastic endometrium enhances less than the adjacent normal myometrium. If there are cystically dilated glands, they do not enhance after contrast administration (Figure 12).36 Similar to TVS and sonoHSG, the MR-imaging characteristics of endometrial hyperplasia are nonspecific and stage 1A endometrial cancer cannot be distinguished from endometrial hyperplasia based on imaging alone. Endometrial polyps are focal excrescences of endometrial hyperplasia covered by endometrium. Three types of endometrial polyps exist:hyperplastic, atrophic, and functional. Hyperplastic polyps resemble glandular endometrial hyperplasia; atrophic polyps are composed of cystically dilated-atrophic glands and functional polyps undergo cyclical changes. Endometrial polyps can be sessile or pedunculated and can protrude into the endometrial canal. The most common locations are the uterine fundus and cornua. Endometrial polyps occur in 10% of women and are multiple 20% of the time. Malignancy is seen in 0.5% of endometrial polyps. Tamoxifen use increases the relative risk of having endometrial polyps. TVS and sonoHSG are the studies of choice for the initial detection and characterization of endometrial polyps.37 MRI is helpful in equivocal cases or when TVS is nondiagnostic. MRI is also helpful in cases where sampling may be difficult (eg, cervical stenosis, large-body habitus). 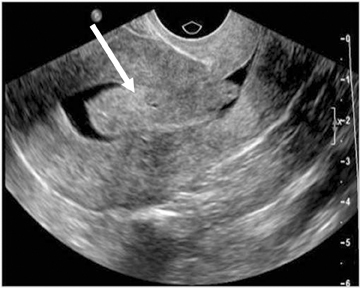 On US, endometrial polyps appear as nonspecific, echogenic endometrial thickening or as a focal, echogenic endometrial mass. Anechoic regions within the polyps may be seen and correspond histologically to dilated glands.35 Color Doppler imaging demonstrates a single feeding vessel. 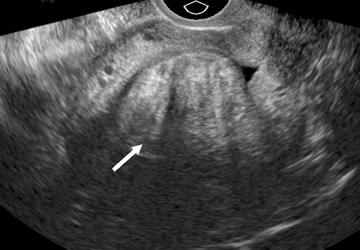 At sonoHSG, endometrial polyps are smooth margined, echogenic masses protruding into the endometrial canal(Figure 13). The MR appearance of endometrial polyps is variable, especially on T2-weighted sequences.38 Most commonly, the MR appearance on T2-weighted sequences is a slightly decreased signal compared to endometrium. Endometrial polyps may also be isointense to endometrium on T2-weighted sequences, appearing as focal or diffuse thickening of the endometrium; heterogeneous with both cystic and solid areas; and/or have a low T2-signal intensity fibrous core or stalk (Figure 14). On T1-weighted images, endometrial polyps are isointense to endometrium. Polyps enhance with gadolinium contrast, usually less than normal endometrium but more than normal myometrium. The contrast-enhancement pattern is not specific. The MR imaging features of endometrial polyp are nonspecific and endometrial hyperplasia and endometrial cancer may appear similarly. Gross BH, Silver TM, Jaffe MH. Sonographic features of uterine leiomyomas: Analysis of 41 proven cases. J Ultrasound Med. 1983;2:401-406. 2.Karasick S, Lev-Toaff AS, Toaff ME. 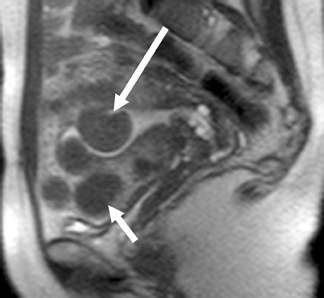 Imaging of uterine leiomyomas. AJR Am J Roentgenol. 1992;158:799-805. Dudiak CM, Turner DA, Patel SK, et al. 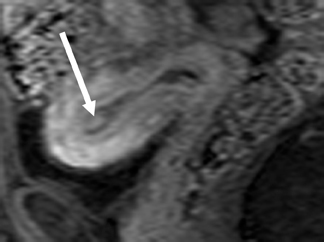 Uterine leiomyomas in the infertile patient: Preoperative localization with MR imaging versus US and hysterosalpingography. Radiology .1988;167: 627-630. 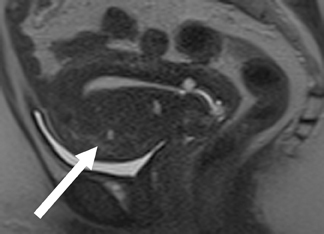 Zawin M, McCarthy S, Scoutt LM, Comite F. High-field MRI and US evaluation of the pelvis in women with leiomyomas. Magn Reson Imaging. 1990;8:371-376. Mayer DP, Shipilov V. Ultrasonography and magnetic resonance imaging of uterine fibroids. Obstet Gynecol Clin North Am. 1995;22:667-725. Liu CY. Laparoscopic hysterectomy. A review of 72 cases. J Reprod Med.1992;37:351-354. Kliewer MA, Hertzberg BS, George PY. 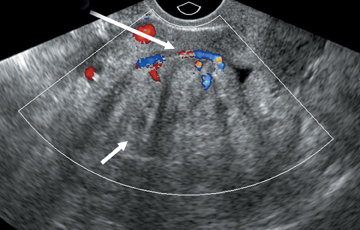 Acoustic shadowing from uterine leiomyomas: Sonographic-pathologic correlation. Radiology. 1995;196:99-102. Weintraub JL, Romano WJ, Kirsch MJ, et al. Uterine artery embolization: Sonographic imaging findings. J Ultrasound Med. 2002;21:633-637. Davis PC, O’Neill MJ, Yoder IC, et al. Sonohysterographic findings of endometrial and subendometrial conditions. Radiographics. 2002;22:803-816. Lev-Toaff AS, Toaff ME, Liu JB, et al. 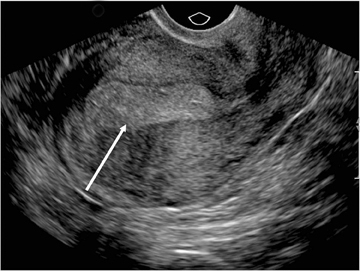 Value of sonohysterography in the diagnosis and management of abnormal uterine bleeding. Radiology. 1996;201:179-184. Becker E Jr, Lev-Toaff AS, Kaufman EP, et al. The added value of transvaginal sonohysterography over transvaginal sonography alone in women with known or suspected leiomyoma. J Ultrasound Med. 2002;21:237-247. Hricak H, Tscholakoff D, Heinrichs L, et al. Uterine leiomyomas: Correlation of MR histopathologic findings and symptoms. Radiology. 1986;158:385-391. Mittl RL, Yeh I, Kressel HY: High-signal-intensity rim surrounding uterine leiomyomas on MR images: Pathologic correlation. Radiology. 1991;180:81-83. Hricak H, Finck S, Honda G, Goeranson H. MR imaging in the evaluation of benign uterine masses: Value of gadopentatate dimeglumine-enahnced T1-weighted images. Am J Roentgenol. 1992;158:1043-1050. 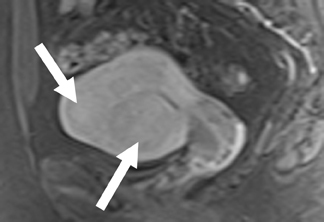 Yamashita Y, Torashima M, Takahashi M. Hyperintense uterine leiomyoma at T2-weighted MR imaging: Differentiation with dynamic enhanced MR imaging and clinical implications. Radiology. 1993;189-721-725. Horie Y, Ikawa S, Kadowaki K, et al. Lipoadenofibroma of the uterine corpus: Report of a new variant of adenofibroma (benign mullerian mixed tumor). Arch Pathol Lab Med . 1995;119:2 74-276. Tanaka YO, Nishida M, Tsunoda H, et al. Smooth muscle tumors of uncertain malignant potential and leiomyosarcomas of the uterus: MR findings. J Magn Reson Imaging. 2004;20: 998-1007. Azziz R. Adenomyosis: Current perspectives. Obstet Gynecol Clin North Am. 1989;16:221-235. Outwater EK, Siegleman ES, Van Deerlin V. Adenomyosis: Current concepts and imaging considerations. Am J Roentgenol. 1998;170: 437-441. Hirai M, Shibata K, Sagai H, et al. 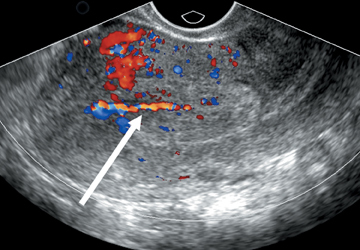 Transvaginal pulsed and color Doppler sonography for the evaluation of adenomyosis. J Ultrasound Med. 1995;14:529-532. Reinhold C, Atri M, Mehio A, et al. Diffuse uterine adenomyosis: Morphologic criteria and diagnostic accuracy of endovaginal sonography. Radiology. 1995;197:609-614. Reinhold C, Tafazoli F, Mehio A, et al. 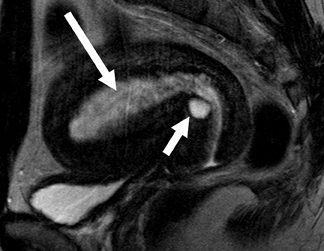 Uterine adenomyosis: Endovaginal US and MR imaging features with histopathologic correlation. Radiographics. 1999;19 Spec No:S147-S160. Reinhold C, Atri M, Mehio Z, et al. 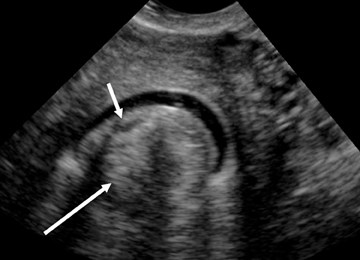 Diffuse uterine adenomyosis: Morphologic criteria and diagnostic accuracy of endovaginal sonography. Radiology. 1995;197:609-614. Fedele L, Bianchi S, Dorta M, et al. 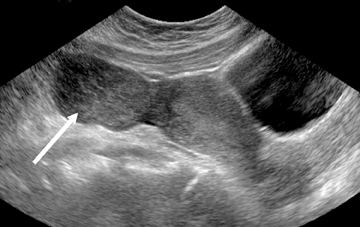 Transvaginal ultrasonography in the diagnosis of diffuse adenomyosis. Fertil Steril. 1992;58:94-97. Atri M, Reinhold C, Mehio AR, et al. Adenomyosis: US features with histologic correlation in an in-vitro study. Radiology. 2000;215: 783-790. Kuligowska E, Deeds L III, Lu K III. Pelvic pain: Overlooked and underdiagnosed gynecologic conditions. Radiographics. 2005;25:3-20. Lyons EA. Ultrasound evaluation of bleeding in the non-pregnant patient. Presented at the 102nd annual meeting of the American Roentgen Ray Society, Atlanta, GA. April 28-May 3, 2002. Chiang CH, Chang MY, Hsu JJ, et al. Tumor vascular pattern and blood flow impedance in the differential diagnosis of leiomyoma and adenomyosis by color Doppler sonography. J Assist Reprod Genet. 1999;16:268-275. Botsis D, Kassanos D, Antoniou G, et al. Adenomyoma and leiomyoma: Differential diagnosis with transvaginal sonography. J Clin Ultrasound. 1998;26:21-25. Togashi K, Nishimura K, Itoh K, et al. Adenomyosis: Diagnosis with MR imaging. Radiology. 1988;166:111-114. Togashi K, Ozasa H, Konishi I, et al. 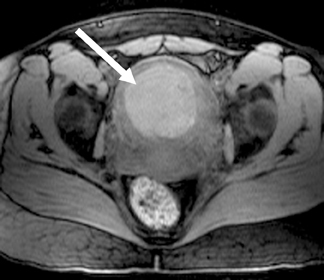 Enlarged uterus: Differentiation between adenomyosis and leiomyoma with MR imaging. Radiology. 1998;171:531-534. Mark AS, Hricak H, Heinrichs LW, et al. Adenomyosis and leiomyoma: Differential diagnosis with MR imaging. Radiology. 1987;163:527-529. Reinhold C, McCarthy S, Bret PM, et al. 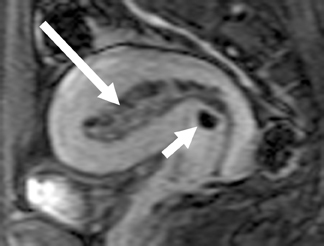 Diffuse uterine adenomyosis: Comparison of endovaginal US and MR imaging with histopathologic correlation. Radiology. 1996;199:151-158. Reinhold C, Atri M. Endometrial hyperplasia. In: Hricak H, Reinhold C, Ascher SM (eds): PocketRadiologist: Gynecology— Top 100 Diagnoses. Salt Lake City: Amirsys, 204, pp.8-10. Sheth S, Hamper UM, Kurman RJ. 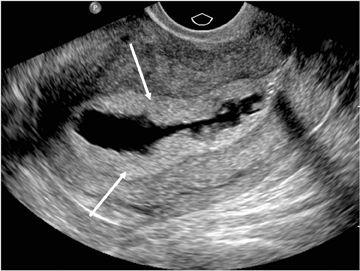 Thickened endometrium in the postmenopausal woman: Sonographic-pathologic correlation. Radiology. 1993;187:135-139. Reinhold C, Khalili I. Postmenopausal bleeding: Value of imaging. Radiol Clin North Am. 2002;40:527-562. Arti M, Nazarnia S, Aldis AE, et al. 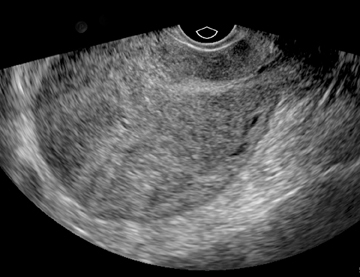 Transvaginal ultrasound appearance of endometrial abnormalities. Radiographics. 1994;14:483-492. Grasel RP, Outwater EK, Siegelman ES, et al. 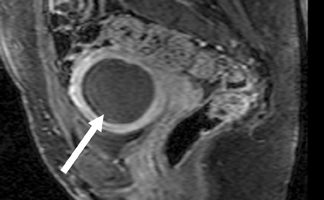 Endometrial polyps: MR imaging features and distinction from endometrial carcinoma. Radiology. 2000;214:47-52. Benacerraf BR, Shipp TD, Bromley B. Improving the efficiency of gynecologic sonography with 3-dimensional volumes: A pilot study. J Ultrasound Med. 2006;25:165-171. Bega G, Lev-Toaff AS, O’Kane P, et al. Three-dimensional ultrasonography in gynecology: Technical aspects and clinical applications. J Ultrasound Med. 2003;22:12491269. Yaman C, Jesacher K, Polz W. Accuracy of three-dimensional transvaginal ultrasound in uterus volume measurements; comparison with two-dimensional ultrasound. Ultrasound Med Biol. 2003;29:1681-1684. Lev-Toaff AS, Pinheiro LW, Bega G, et al. Three-dimensional multiplanar sonohysterography: Comparison with conventional two-dimensional sonohysterography and X-ray hysterosalpingography. J Ultrasound Med. 2001;20:295-306. Ghate SV, Crockett MM, Boyd BK, et al. Sonohysterography: Do 3D reconstructed images provide additional value? AJR Am J Roentgenol. 2008;190:W227-W233. Liapi E, Kamel IR, Bluemke DA, et al. Assessment of response of uterine fibroids and myometrium to embolization using diffusion-weighted echoplanar MR imaging. J Comput Assist Tomogr. 2005;29:83-86. Fujii S, Matsusue E, Kigawa J, et al. Diagnostic accuracy of the apparent diffusion coefficient in differentiating benign from malignant uterine endometrial cavity lesions: Initial results. Eur Radiol. 2008;18:384-389. Epub 2007 Oct 5. Wolfman DJ, Allison SJ, Ascher SM. Imaging of benign uterine conditions. Appl Radiol. 2011;40(10):8-15.